What are the similarities and differences between Slapton Sands and Utah Beach? 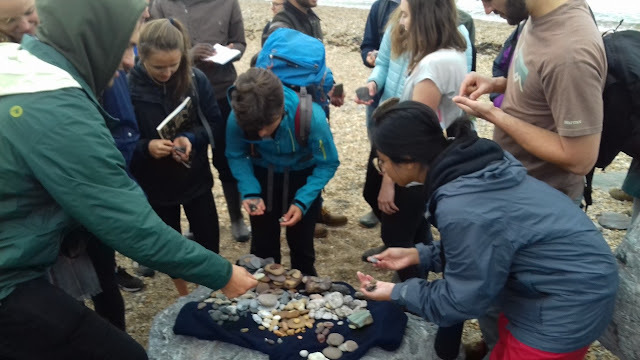 Challenged by this question, is how 36 bright MsC/MPHIL Environmental Change and Management students from the University of Oxford started their field trip along the Start Bay coastline in the South coast of Devon, England, UK. 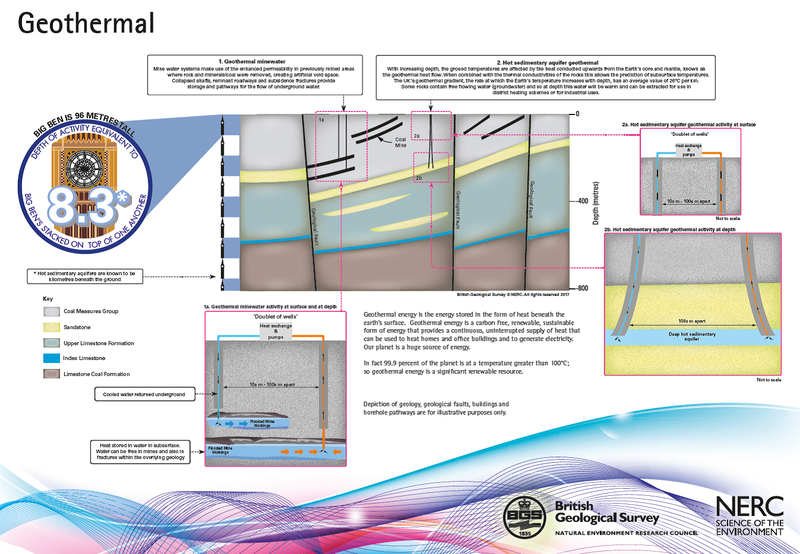 I am Andres Payo, lead researcher of the coastal resilience and marine shallow geohazards research line at the British Geological Survey, and I want to share with you my experience on how to communicate the importance of geology on issues that matters to people today. On Sunday 30th of September 2018 I was driving from the nearby hotel to the Slapton Ley Nature Centre where I will meet the students to start the field trip with a one-hour introductory talk. I am not alone on this trip but with my wife Ruth and my son Andres to whom I am keen to show the beautiful coast of Start Bay. We have eaten our breakfast as fast as possible (you do not want to be late when not one, but 36 people are waiting for you) and gave us a good 40 minutes for what is only a 20 minutes’ drive along the coast. When we were only 2 minutes away from the Centre…surprise! the road was closed because it was damaged during the last storm (duh! I should have known that!). We have to turn around and spend another 20 minutes driving through an alternative route to the Centre to reach the place just right on time. Even before I start the describing the talk and walk, here you have the first issue that connect coastal processes (coastal erosion) with an everyday activity (driving from A to B). Why I started this talk with the question outlined in the title has two logical reasons. The first one is the historical connection between Slapton and the D-day (thanks to Andrew Hughes for pointing me towards the Operation Tiger facts). The second one is just because my experience with Oxford MsC students (this is the second time that I lead this talk and walk) tells me that they just love to be challenged. If you are wondering what are the main geomorphological similarities and differences between this two sites you will have to search the internet and look at the two pictures above in detail. 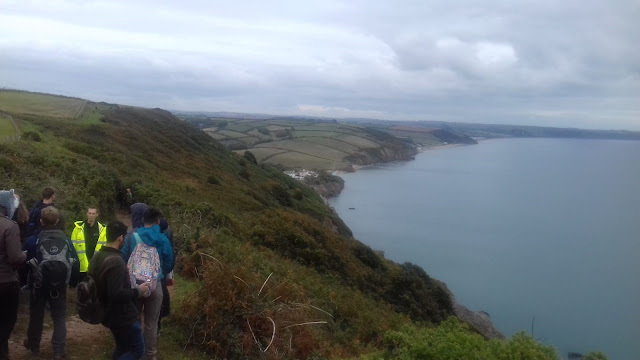 In the internet you will find that one key similarity was the presence of the coastal lagoon (Slapton Ley) as the Germans did inundated the coast to make it more difficult for the troops to advance. There are not that many large lagoons in UK. 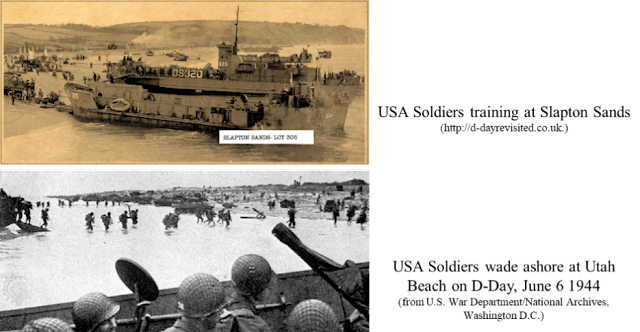 By looking at the two pictures you will notice that there are no soldiers walking with their boots underwater in the gravelly Slapton but you see a few in the sandy Utah beach. As the sediment size becomes smaller so does the slope of the beach. That is why the boats could reach the very shoreline in Slapton but not in Utah beach. To avoid this blog becoming too long, I will let the students describe what they think geology is before and after the day that we spent together. Before that, I would also like to acknowledge the great outlines that Dr Gerd Masselink from Plymouth University shared with me to help me deliver the talk and walk. “As for my impressions on geology before and after the talk, there are two main points: a) geology is less static than I previously thought and b) geology does have an impact on a human timescale. Let me expand on those two points. Even though I took the class on Coastal Landforms and Processes like I mentioned, I still thought of geology itself as more the study of static rocks, i.e. this rock is type A made of minerals xyz and this is type B made of minerals uvw (kind of what we did for the very beginning of the talk, on igneous, metamorphic and sedimentary rocks). For some reason, I thought of geology as separate from wave action, erosion and sediment transport, which are dynamic processes. This field trip crystallised for me the links between the study of the rock parent material (what I thought geology was mostly about) and the study of dynamic changes the parent material undergoes. If you have read the students feedback all the way until here and you are a geologist, you are probably feeling as happy as I am feeling 😉…any time that I might feel down, I will re-read this post to boost me up. Why are we concerned with Australian Drought? Australia is recognized as the driest inhabited continent with remarkable deviations in rainfall both spatially and temporally. With a simple satellite image, one can see these changes in precipitation where the deep green of the east coast rapidly transition to shades of brown moving inland. Situated in the middle of this transition, in the sub-tropics of Eastern Australia, lie some of Australia’s most fertile farm lands, largest and most biodiverse ecosystems and the third biggest urban area (Brisbane). Due to the rapid population expansion and agricultural pressures, climate change is likely to have dramatic effects on local water supply. A report submitted by The Bureau of Meteorology and the Commonwealth Scientific and Industrial Research Organisation (CSIRO) in 2016 states that Australia has experienced a mean temperature increase of 1oC since 1910. Naturally, drought is not an uncommon occurrence here. Since the settlement of Europeans, up to seven major droughts have been recorded. The most recent drought, dubbed the “Millennium Drought” starting in 2001 and which lasted till 2009 caused over $7 billion in losses in agriculture per year, major strains on power production, and created reductions in drinking water availability. However, the true responses of future climate scenarios are difficult to uncouple due to the lack of understanding of past climate variability and its complex interactions with human disturbances. Thus, understanding the past to inform future long-term changes in hydrological balances and frequency, scale, and intensity of droughts in the subtropics is critical for the development and security of Australia. Roughly 100 km west of the east coast, Coalstoun Lakes National Parks may just hold the key to uncovering Australia’s climate history. Situated within an agricultural district, an unsuspecting volcanic remnant is extruded 150 m off the local basin floor. Despite the seemingly desiccated exterior of this landform, nestled tightly within the caldera lies an oasis of lush rainforest encircling two small lakes (~1 km2 each). For nearly ~600,000 years the creators have persisted, potentially making the Coalstoun Lakes containing the longest and continuous palaeoecological record for Queensland. Like two buckets, these lakes accumulate rainfall during the sub-tropical summers and slowly redistribute their contents to the local wildlife and aquifer. As the rains recede, drawing into the drier winter’s months, the water slowly become exhausted by either evaporation or groundwater discharge, unless replenished by the following year’s wet season. Along with the rain, over time sediments have been accumulating, filling the basin with exotic aeolian particulates, adjacent hillslopes sediments, and local in-lake production year after year. Stacked in sequential order, remnants of the sub-tropics complex environmental history is preserved through glacial and interglacial times. This makes Coalstoun Lakes an exciting and ideal site for reconstructing past climates over a long timescale. The two main research areas for my thesis are: 1) evaluate the paleoclimate of the eastern subtropics of Australia by utilizing stable isotopes, and 2) create a modern hydrological model of the Coalstoun Lakes system using a mass balance approach. These research focuses will be accomplished utilizing an assortment of samples (ie: vegetation, a 4.5 m sediment core, two species of snail shells, and soil samples) which were collected by a variety of scientists over several years. In addition, future plans are in motion to extract two pairs of cores from both lakes approximate depth of 15 m, covering nearly 150,000 years of climate. My intended focus is on stable isotopes from sponge spicules but I have taken advantage of an available core (thanks to efforts from Mike Evans and Kevin Welsh) to look at some carbon isotopes also. To start my project off on the right foot, in mid-September I undertook a three week stint at the British Geological Survey’s Stable Isotopes Facility and the University of Nottingham under the advisement of Prof. Melanie Leng and Dr. Matthew Jones, respectively. The first two weeks at BGS were focused on preparing and weighing vegetation and sediments to be analyzed for organic carbon isotopes, along with any calcium carbonate containing layers for bulk oxygen isotopes. With any additional time between running samples, I began sampling on a snail shell. In short, snails consume moisture from rainfall which is incorporated in the structure of its aragonite based shell. As, the organism grows it retains the oxygen isotope allowing us to reconstruct the precipitation variability over its lifespan (~10 yrs). We selected one species of snail (biggenden banded snail) and began the intricate sampling by drilling 0.8 mm holes into the shell. In all, 200 samples were attained from the apex (oldest section of the snail) to the outer rim. Samples were carefully collected perpendicular to the growth bands simultaneously recording all flaws or cracks to aid in data interpretation. Results of the analysis will not only give us insight on the modern climate, but it will also provide us with an interesting perspective on the local biology and lifecycles of the Biggenden Band Snail that has yet been documented. During my final week, I spent acquiring information on hydrological and isotopic modeling at the University of Nottingham. I focused my attention on developing an experimental design and setup to aid in model selection. Specifically, I annotated manuscripts utilizing mass balance approaches help in my understanding of model sensitivity and complexity. This prompted discussions on future sampling procedures and instrument set up that will optimize our modeling efforts. My time at BGS and the University of Nottingham has provided a fantastic opportunity to work with an interdisciplinary group of scientist. In the future, I hope continued collaboration is possible to help guide my academic growth and cementing the techniques and skills needed for coupling of both hydrologic and isotopic disciplines. As the preliminary data are continued to be analyzed, we begin to piece together the intricate past of Australia’s drought history. With any luck, the implications of our work will directly address frequency, severity, and duration of drought hazards and future climate scenarios we may face. 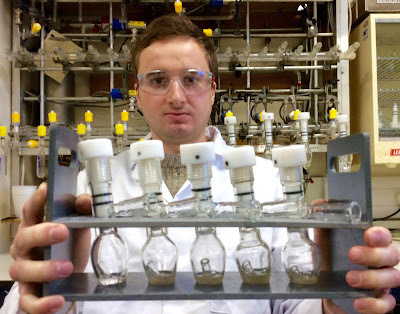 Nick Patton is a PhD student at the University of Queensland, working in collaboration with Prof Melanie Leng and Dr Matt Jones (BGS and University of Nottingham). It is easy to fall into the mind-set that university is the only option if you want a solid career with a good wage. That is the mind-set I fell into when I was picking out which A levels I wanted to work towards. The problem was, at 16, I had no idea what I wanted to do or what I was working towards. As a result, I had no direction. I did my AS exams (I did not entirely fail...or pass) and then I decided that the best thing for me to do was drop out. Was I giving up any chance of a career? Would I be stuck working a low paid job for the rest of my life with no hope of career progression and wage growth? At that point, it hit me. There was another route to success available to me. In the current climate of apprenticeships and college courses, with the right attitude and work ethic, you can pick up a career without a degree. I had just turned 17. How does a 17 year old decide what they want to do for the next 50 years of their life? My interest was in computers; I had built my own gaming computer, fixed my parents computers, soldered wires together my rabbit had chewed. I decided that would be what I would pursue. Bring on the job hunt! I started searching for an apprenticeship that I could travel to easily. Thankfully, living in Nottingham, there are lots of IT opportunities in the area. I found a college course in IT that promised an apprenticeship. I applied, went for an interview and I was offered a position at the college, starting in August. BGS held a round of interviews for about 15 people in my college course, with two job openings. I applied and interviewed for both a Network Support role and a Web Developer role. For my interview, I took in a copy of a website I had made at college in the hope this would increase my chances. I recently asked the Head of Information Systems, Patrick Bell, what made him decide to hire me over the others? He said that my ability to communicate with adults and my enthusiasm towards computers were what mainly got me the job. Admittedly, at the time, I wanted the Network Support role, as I had no idea how anyone could write code (how times have changed!). BGS offered me the role of Web Support Apprentice (Web Developer) and I haven’t looked back since. During my first months at BGS, I worked hard. I spent hours learning simple coding languages (HTML and CSS) and received tutoring from my line manager in the harder to grasp concepts. I was making changes to existing web pages and creating basic pages of my own from scratch. My work was relatively simple, but allowed it me to find my place in web development. Upon completion of my apprenticeship, BGS offered me a permanent position as a Web Developer. This is where my career really started to take off. I took everything I had learnt over the year of my apprenticeship and kept on learning. I spent hours at home learning more and more in my own time and actively sought help from colleagues on areas that were harder to grasp. I would say the key to being successful in your apprenticeship and the beginning of your career is not losing your enthusiasm. I gradually found my niche in front-end development; I am good at it and passionate about it. I transferred onto teams as the front-end developer where the whole look and feel of the application was down to me to work on. This was daunting at first, but it allowed me to learn so much that I wouldn’t have learnt if I was working under someone else’s guidance. I spent hours researching best practices and ways to make websites usable by all types of users, including those that are visually and hearing impaired. 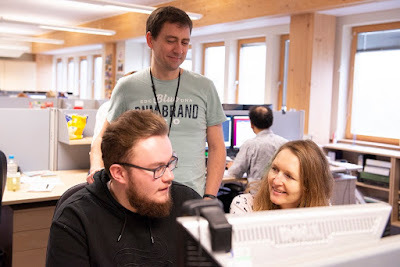 I received guidance and tutoring from my colleagues to grow my knowledge to cover the full stack of application development including the creation of databases. This led to me being the sole developer on some projects, where I advanced existing code written by more experienced developers. I then went one-step further and designed the complete architecture for an application called GeoSocial. GeoSocial harvests social media messages relating to geohazards (landslides, floods, earthquakes, volcanic eruptions) and displays geo-located tweets on a Graphical User Interface (GUI). I was responsible for deciding the server operating system to use, the language for the backend and frontend code and the software for the database. It was then down to me to develop, configure and manage the system! This is still my proudest achievement to date, not because the system is overly complex, but because in the space of 2 weeks I created a robust system from scratch with very limited knowledge of most of the technologies I was using. When I began my full time contract at BGS, I started on a junior grade at Band 8. After a couple of years at this band, growing my programming and professional skills, I was encouraged to apply for promotion. This was quite a gruelling process, but made me aware of the bigger picture to the work I was doing. After around 5-6 months of creating my promotion case, with continuous feedback and help from many experienced colleagues and managers, I sent off my application for review. Around two weeks later, I received an interview offer and went to London for an interview with very senior members of staff from across the Natural Environment Research Council (NERC). Whilst this was perhaps the scariest thing I have done at work, it definitely helped me with my long-term career goals. Shortly after the interview, I received notice that my application was successful, and I was promoted to the graduate grade of Band 7! During my time at BGS I’ve been privileged to be able to visit Bucharest and London for week long trips, I’ve been down to Southampton to attend a conference and I’ve had countless training courses. BGS has given me the knowledge and opportunity to become the developer that I am today and receive the salary that I will be doing upon my departure from BGS. My experience at BGS really does show that apprenticeships are a great way for companies to find new employees, and that young people do not necessarily need to get a degree to get a lifelong career. 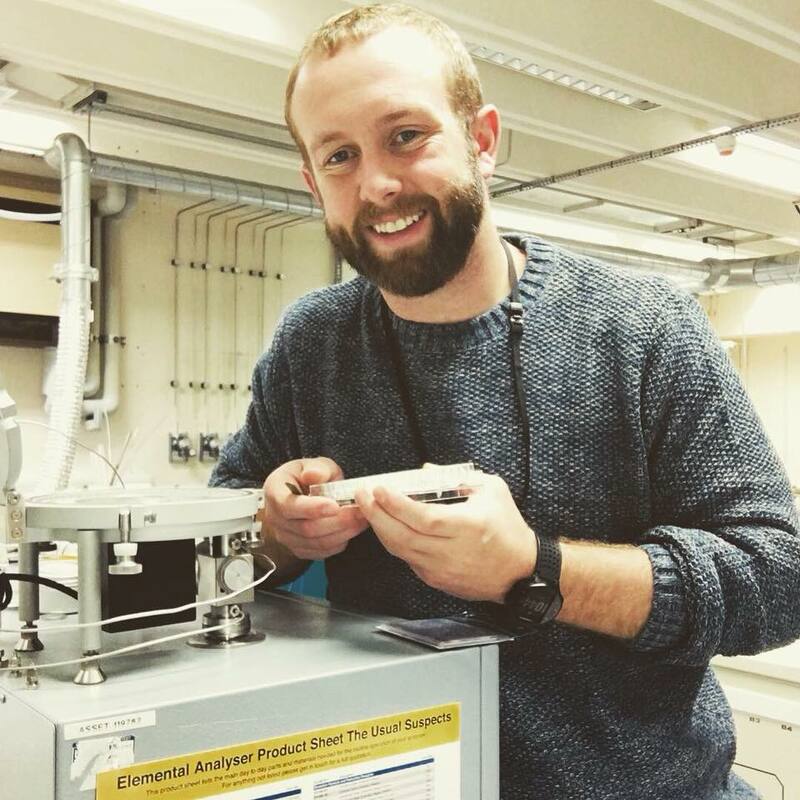 Hi, I am Blaine Hancock and I began a NERC funded PhD at the University of York in October 2017 working in partnership with the British Geological Survey and Environment Agency. 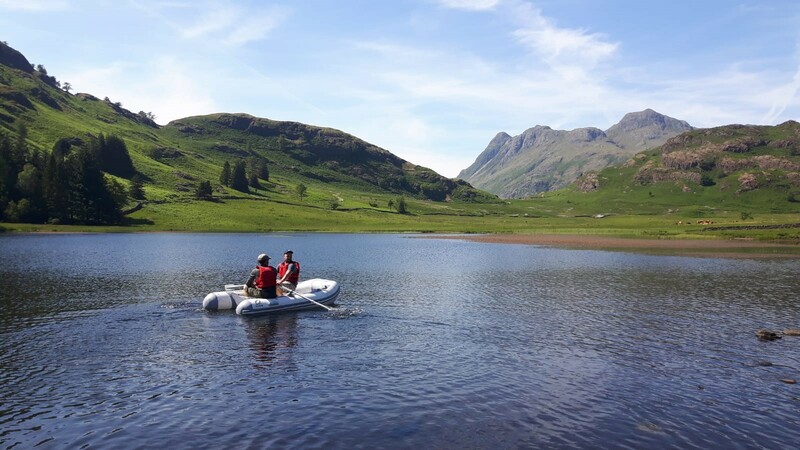 My main research aims are to understand how the biogeochemistry and productivity of small English lakes have responded to anthropogenic climate change and using this to predict how they may change in the future. The impacts of climate change on lake biogeochemistry is largely understudied with the majority of research investigating impacts at a hydrological level. Biogeochemical changes in small lakes are particularly understudied despite 90% of England’s estimated 6,000 lakes falling within this classification (<10 ha in size). Small lakes tend to support more unique and threatened species compared to larger lakes with many of them in England being granted Site of Special Scientific Interest (SSSI) status and/or are designated conservation sites. Evidence suggests that these refuges for threatened species show an enhanced response to climate change, which is characterised by a faster rate of water temperature rise than in larger and deeper lakes. In general, climate change is expected to produce conditions which will become increasingly unfavourable to submerged plants. Increases in the cycling of carbon and nitrogen through a lake catchment has the potential to increase algal growth in surface waters and reduce light penetration. A loss of submerged plants will have a significant impact on the organisms that depend on them and degrade the lake ecosystem as a whole. It is therefore essential that we understand how lake biogeochemistry responds to changes in climate and how this impacts lake systems at an ecological level. Through this we can make predictions as to how these lakes will change in the future. My study sites (Lake Gormire, North York Moors; Sunbiggin tarn, Yorkshire Dales; Blea tarn, Lake District) are all SSSI’s with Lake Gormire containing sparse but rare species of macrophyte and Sunbiggin Tarn a recognised conservation site for three species of very rare snail. Sediment cores were taken from each lake using a gravity corer over the summer of 2018 and subsampled on the shoreline. The cores will be dated using radiometric techniques to establish a chronology and will most likely reach back to around 1850AD. The cores will also be analysed for carbon and nitrogen isotopes at the BGS Stable Isotope Facility to assess how changes in the sources of organic matter to the lakes have developed over time. Sedimentary pigments (chlorophyll and carotenoids) will also be used to assess how the lakes productivity has changed and uncover the wider impacts to algal communities. Together these data will be compared with historical instrumental weather records to provide a robust understanding of how climate change experienced in the UK over much of the 20th and 21st centuries has affected lake biogeochemistry and productivity. This information will be used to project future lake conditions and help understand the direction and magnitude of biogeochemical change in English lakes. Blaine is a NERC-funded PhD student at the University of York, supervised by Dr Katherine Selby (University of York), Dr Glenn Watts (Environment Agency), and Dr Jack Lacey (British Geological Survey). In less than a week I will be heading off to the Southern Ocean to help with “fieldwork” (seawork is more appropriate!) collecting seawater samples for ORCHESTRA. ORCHESTRA (Ocean Regulation of Climate by Heat and Carbon Sequestration and Transports) is a programme funded by NERC and includes partners at the British Antarctic Survey (lead), the National Oceanography Centre, Plymouth Marine Laboratory, and many more including BGS. Why are we collecting seawater samples from the World’s oceans? Since the industrial revolution, the global ocean has absorbed around 30% of anthropogenic (human-produced) CO2 emissions. In addition, 93% of the total extra heat in the Earth system since the onset of global warming has been absorbed by the global ocean. This is equivalent to around 170 terawatts — the power that would be required for each of the seven billion people on Earth to continuously operate sixteen 1500 watt hairdryers! Improving climate prediction requires us to learn more about how the global ocean works, and how it interacts with the atmosphere to control the split of heat and carbon between them, especially given the extra heat and carbon we are currently producing. 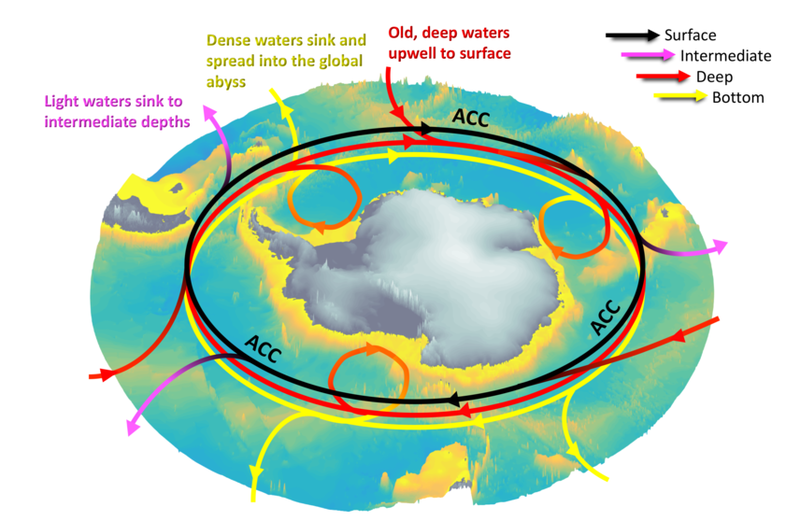 The overturning circulation in the Southern Ocean. back into the ocean interior taking heat and carbon with it. A key region in this context is the Southern Ocean, the vast sea that encircles Antarctica. The Southern Ocean occupies around 20% of the total ocean area, but absorbs about three-quarters of the heat that is taken into the ocean, and approximately half of the CO2. This is because of its unique pattern of ocean circulation: it is the main region where deep waters rise to the surface, allowing new water masses to form and sink back into the ocean interior. This exposure of “old” waters to the atmosphere, and the production of new waters at the surface, is fundamental to the exchanges of heat and carbon with the atmosphere. Despite knowing the key role that the Southern Ocean plays in global climate, there are many important unknowns. These include how exactly heat and carbon are taken up by the oceans and how fast this occurs (especially important because of the Anthropocene period we are living in), and how much heat and carbon is currently stored in the oceans. These questions are being addressed using various chemical and physical measurements of the ocean, including the stable isotope composition of the seawater (which we are responsible for at the BGS). Oxygen isotopes will tell us about how much freshwater to seawater there is at particular locations (which will help us understand melting of the Antarctic ice mass and therefore heat) and carbon isotopes will tell us where the carbon is formed and how the ocean uses the carbon. ORCHESTRA is in the second year of a five year collection programme around the World’s oceans. 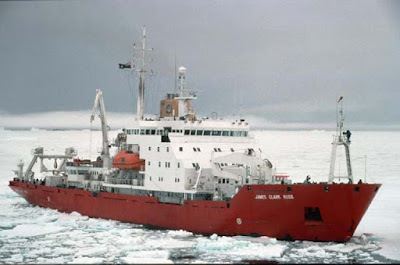 I will be collecting samples from the RRS James Clark Ross. Next week I will fly to the Falklands Islands and then cruise south across the Drake Passage to Antarctica, collecting samples and making measurements along the way. Finally we will return to Port Stanley before flying home. I hope for Fair Winds and Following Seas! I will be tweeting @MelJLeng and @ORCHESTRAPROJ and Facebooking (Orchestra project) along the way, as well as updating the BGS Geoblogy and drakepassageblog.wordpress.com when I have time. heat network in the UK’s former industrial towns and cities. The warmth from old coal mines could be used to heat the homes of people living in fuel poverty, writes Professor John Underhill. Fuel poverty is one of the leading social challenges in Scotland today and it will be the renewed focus for many as the nights draw in, and we ready ourselves for winter. As more than one in four households will struggle to make ends meet over the next few months, it may come as a surprise to learn that a solution to this social and energy crisis may lie directly beneath our feet. Currently defined as a household that needs to spend over 10 per cent of its total income on domestic heating, fuel poverty impacts 650,000 (26.5 per cent) Scottish homes. More than 183,000 are classified as extreme cases because 20 per cent or more of their annual household budget is spent on heating. One in ten are families with children and around 90 per cent are either owner-occupiers or people living in social housing. The largest concentration of households affected lie in densely populated urban areas which grew up around heavy industry and manufacturing centres. Many of these have long since reduced in size or closed, leaving a landscape and community blighted by high unemployment and deprivation. Given the scale of fuel poverty, the time is ripe to reap the benefits of geothermal heat generated by old coal mines. It’s ironic and perhaps paradoxical to suggest that a solution to the fuel poverty crisis could come from the most polluting, black and dirty fossil fuel which we, as a nation, have worked so hard to remove from our energy mix. This effort has been so effective that the UK power generation had its first coal-free day last April. 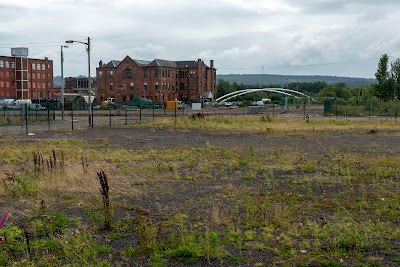 site in Clyde Gateway, a regeneration area. Up until the discovery of oil and gas on the UK continental shelf 50 years ago, coal was the bedrock of our energy needs. Although its use was introduced before coal’s detrimental impact on human health and climate change was fully appreciated, the over-reliance on one fuel-stock led to tensions between Government and the industry. The opening up of the North Sea petroleum province in the 1960s and 70s altered that dynamic and provided a new, cleaner alternative power source. Major gas production drove a change with domestic supplies shifting from coal fires to gas-powered cookers and central heating systems. The UK had plentiful gas reserves that more than met the country’s needs until 2001. However, the past two decades has seen an inexorable decline and we now rely on international imports for over half the total required to keep the lights on and to heat our homes. Some have argued the shortfall could be addressed through shale gas extraction but that has proved hugely controversial due to environmental concerns. Significant question marks have been raised about whether the UK’s geology supports extraction on the scale required. To date, the focus on geothermal energy in the UK has concentrated on areas like the granites of the Cairngorms and Cornwall because they have a higher geo-thermal gradient. While it’s evident these areas can provide heat locally, industrial-scale supply to the people that need it most is impractical because of the difficulty of storage and transportation to centres of population. 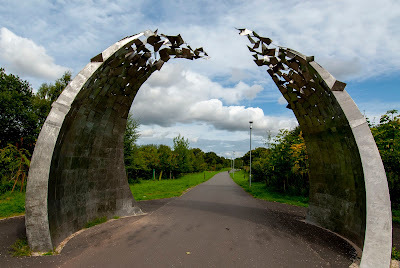 Clyde Gateway that houses a range of different leisure facilities for locals. But a different kind of geothermal heat source could provide an answer: renewable energy from the most unlikely of sources. A major benefit of coalfields is that most are close to and often directly beneath large conurbations. Although they are not going to be as productive as areas marked by volcanic activity, like Iceland or Hawaii, they could provide enough heat to serve the needs of the stressed communities where fuel poverty hits hardest. Coal mine geology is also highly favourable and, unlike solid rocks where natural porosity, permeability or fracture patterns dictates flow, water can pass through a pit’s trellised network of shafts more easily since they are akin to fluid ‘super highways’. The process by which heat can be extracted is similar to that used by a fridge. The warm water from the mine is moved into a store in which a refrigerant can extract the heat and convert it to a gas. The gas passes through a compressor which heats it to around 50C to warm the water in a tank. This then supplies warmth to the property. The compressor does use up some electricity but is hugely efficient, giving back around four times more energy than is needed to power it. The cooled water extracted from the mine, the gas needed to heat the water tank and the hot water used to heat the house can all be used again in the same process. Importantly, the system can be reversed and a building may be cooled during summer months. Small pilot schemes are already working to supply heat from coal mining areas to a housing estate in Rutherglen and a swimming pool in Stanley, County Durham. The Scottish Government’s Geothermal Energy Challenge Fund is supporting studies at Fortissat, North Lanarkshire, Polkemmet in West Lothian and Grangemouth in Stirlingshire. 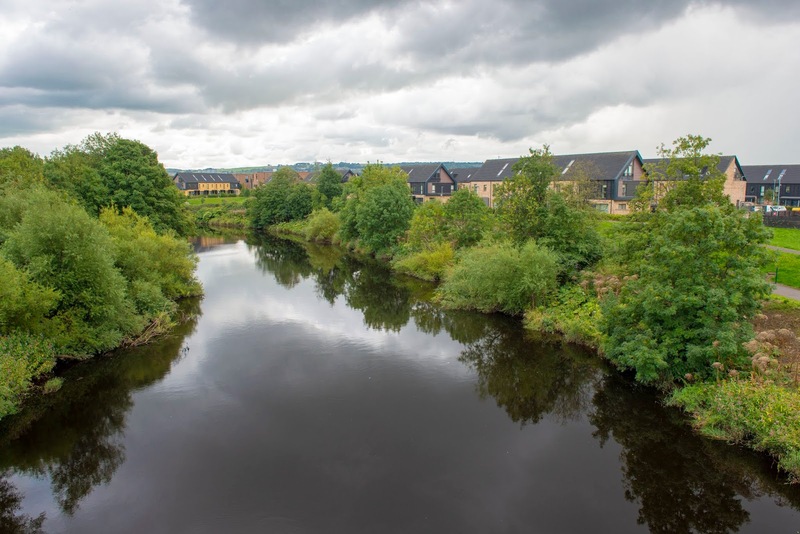 In addition, a sedimentary aquifer project is being investigated at the site of an old paper mill at Guardbridge near St Andrews and a large-scale district heating network is serving a low-carbon development in Kilmarnock. While the Rutherglen housing scheme demonstrates that old mine workings can supply heat locally, the question remains – can heat supply be replicated on a scale with a positive impact on social well-being? A large research site is being developed in the Clyde Gateway, an area of urban regeneration in the east end of Glasgow. This article appeared in The Scotsman on 16th October 2018 and is reproduced with the kind permission of Prof John Underhill and Herriot -Watt University. The world needs to efficiently phase-out its dependency on fossil fuels and bring in a balanced mix of sustainable energy sources, such as wind and solar renewables, and probably nuclear power. In the UK governments’ 2017 Clean Growth Strategy, three long-term technological ‘pathways’ were predicted in order to help us reduce greenhouse gas emissions by 80% by 2050. In reality, we will need to utilise a mix of these options. Pathway one, the ‘electricity pathway’, represents a straightforward replacement of fossil fuels used in electricity generation, household heating and industry, with renewables and nuclear power. This route is attractive because it potentially represents the most efficient and fastest way of substantially reducing emissions. However, a problem with this route is that natural gas is embedded in the design of our power plants, electricity distribution, heating and transport infrastructure. Electrification of this infrastructure will be expensive, but nonetheless perhaps offers the best way to reduce emissions, at least from a national perspective. The second option, the ‘hydrogen pathway’, utilises hydrogen for heating of homes and buildings, and as fuel for vehicles and in industry. Rather than replace our gas infrastructure, it is instead modified so that it can be used for hydrogen rather than hydrocarbons (e.g., natural gas). Hydrogen gas can be generated from water, biomass, natural gas or following coal gasification. Steam reforming of natural gas coupled with carbon-capture and storage (CCS) is a promising way to reduce emissions whilst, to some degree, avoiding the costly process of replacing our existing infrastructure. Given fossil fuels are not being replaced with renewables at the required speed globally, particularly in some developing countries, this pathway is perhaps a pragmatic and outward-facing approach to reducing global emissions. Substantial ‘inertia’ in the global fossil-fuel energy sector could mean coal and natural gas are utilised as a significant source of power generation for longer than expected. The third option, the ‘emissions removal’ pathway, utilises biomass power stations coupled to CCS in order to remove CO2 from the atmosphere and store this in geological reservoirs. This route is possibly the only means which global emission reduction targets can be met, but is problematic because it will stress resources such as arable land, fertilisers, water and ecosystems. So, do shale resources have a place in Green Great Britain? In order to completely switch to renewables and nuclear power (‘electricity pathway’), by definition, shale gas cannot have a long-term future in UK or globally. That said, locally extracted natural gas is potentially a short to medium-term ‘bridge’ between coal, oil and gas and sustainable sources of energy. In a global context, locally extracted gas is potentially preferable over imported gas, because in the UK we have strict regulations which protect the environment, and the fugitive emissions by long gas pipelines crossing parts of Europe is significant. A key part of my research focusses not only on the hydrocarbon (oil and gas) prospectivity UK shale, but also understanding the broader resource potential of shales. UK black shales can contain high concentrations of metals (‘metalliferous’), which might be mined or even co-extracted during hydraulic fracturing or during remediation of waste water. The problem is no two shales are the same; the amount of gas and metals present in the rock varies substantially. This ultimately comes down to the environment of deposition – in other words – what did the environment look like millions of years ago? We know Mississippian black shales in the UK were deposited in shallow seaways. 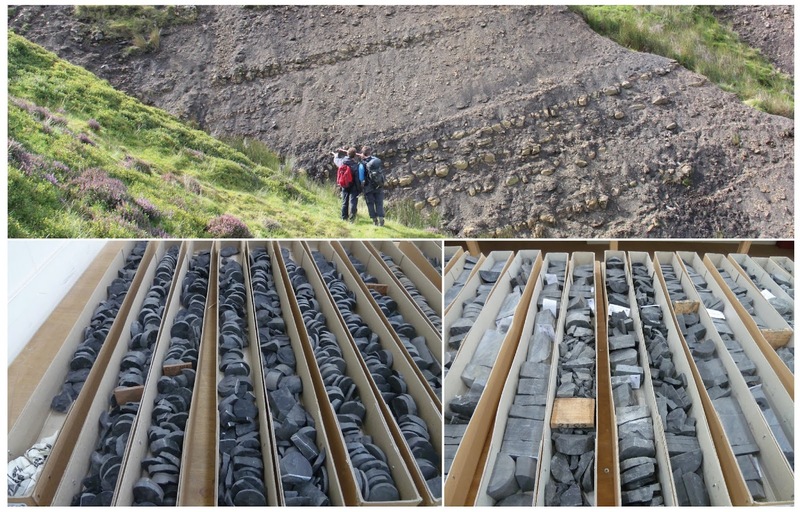 By studying the geochemical composition of UK black shales, we know these marine settings lacked oxygen (termed ‘anoxic’), an environment that is similar to the modern Black Sea. Understanding when and how seawaters became oxygenated is important for understanding the resource potential of shale. The geochemical proxy record shows that seawaters were rich in hydrogen sulphide (H2S), a gas that is highly toxic to aerobic organisms. H2S is produced when other ‘electron acceptors’, such as oxygen, are absent. Anaerobes that live in the water instead respire using dissolved sulphate (SO4) and produce H2S as a product. This means UK black shales contain lots of pyrite (FeS2, ‘fools gold’) and are enriched in many ‘redox-sensitive’ metals, including Co and Ni. The required expansion of renewables and batteries used to store electricity (‘electricity pathway’) is increasing the demand for metals, such as Co and Ni. Steam reformation of natural gas, used to produce hydrogen as part of the ‘hydrogen pathway’, also requires metals as catalysts. So in this respect, shale resources, as gas or metals, might have a part to play in becoming Green Great Britain. 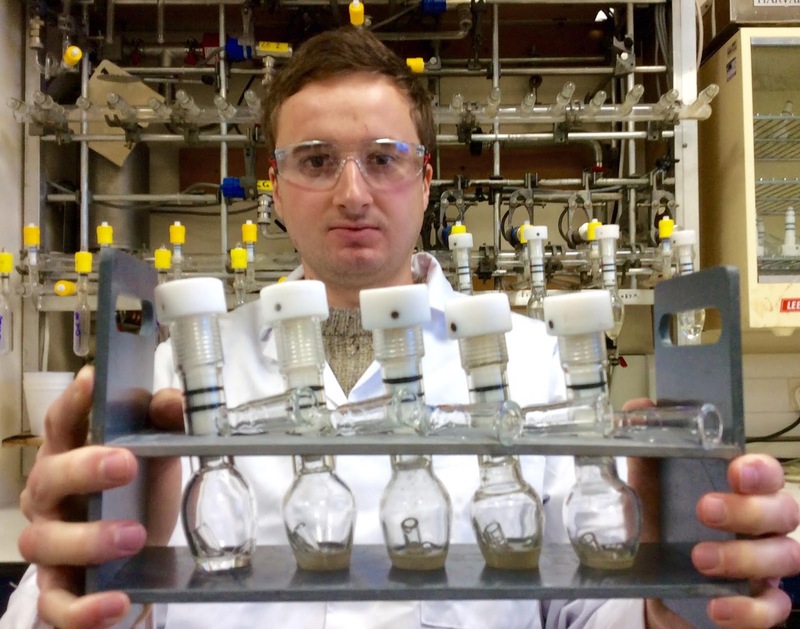 Joe Emmings is a Post-Doctoral Research Associate in Geochemistry at the British Geological Survey’s Stable Isotope Facility and Centre for Environmental Geochemistry. Please contact Joe if you are interested in his research field. Coal is often referred to as the dirtiest of fossil fuels. It produces 40% of the world’s electricity demand, is responsible for 39% of CO2 emissions and causes big problems with air pollution worldwide. In 2012, the use of fossil fuels, in general, has resulted in 34.5 billion tonnes of carbon dioxide being emitted. These emissions need to be dramatically reduced. Earlier this month, we were reminded by the UN’s Intergovernmental Panel on Climate Change (IPCC) of the urgency of this task to reduce emissions and to end coal-fired electricity by 2050 in order to cut the risk of experiencing extreme heat, drought, floods and poverty in the future. Therefore, alternative, low-carbon sources of energy are urgently needed for the world to be able to reduce CO2 emissions and limit global warming temperature rises as well as to increase energy security and eliminate fuel poverty. Coalmines are just the place to help with this, despite their ‘dirty’ past. They can provide a low carbon alternative for heat production, and here is how. There are vast amounts of energy stored in the Earth beneath our feet, which are ultimately provided from two sources: the earth and the sun. Decay of radioactive elements in the Earth’s core provides a constant supply of heat within the earth that dissipates up to the crust. As a result, the deeper we drill into the earth the warmer it gets, with temperatures rising by about 2.5°C for every 100m of depth. At the same time, the insulating effect of the shallow subsurface is able to store heat from sunlight as well as that lost to the subsurface from the basements of buildings and from other subsurface infrastructure in cities, such as sewers or tunnels . This heat resource is typically distributed by natural groundwater systems and through man-made structures such as the abandoned coal-mines that underlie many of the UK’s cities and towns. Abandoned coal mines comprise networks of flooded voids with water flowing at depths of a few tens of metres to several hundred of metres below the surface. Even in the shallower mines, temperatures of mine water are elevated, typically around 12-16°C and often higher, especially where mines are deep. It is this resource that can be exploited for space heating through use of a simple, but ingenious piece of technology: Ground Source Heat Pump systems. These systems take the energy from the thermally-enhanced mine water and upgrade it to higher temperatures, e.g., around 40-50°C, for use in domestic heating. 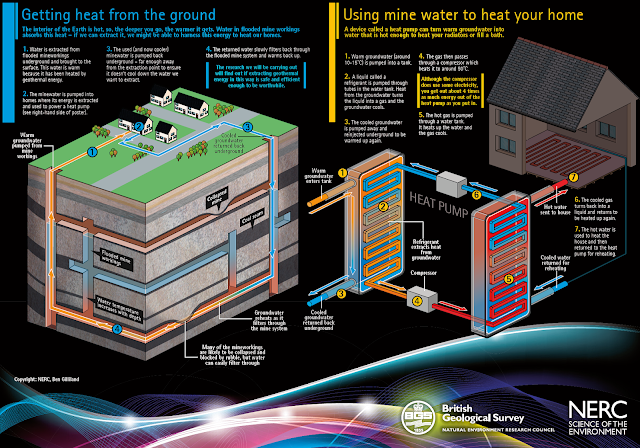 How is geothermal energy stored? The “heart” of the ground source heat pump system is the actual heat pump. It works in the same way as a fridge that cools your food by absorbing heat from the food in the fridge and, using a heat exchanger, releases it to the surrounding air via the condenser coils at the back of the fridge (which are always warm because of this). Heat pumps do exactly the same. They absorb the heat from the mine water, upgrade it and release the “concentrated” heat via the home heating system. Heat pumps require a small amount of external power to accomplish the work of transferring energy. However, for each unit of energy input, the heat pump provides 3-4 units of heat energy output, and hence these systems are much more efficient than conventional gas- or oil-burning heating systems. Because of this high efficiency, minewater-based heating is almost carbon-neutral, especially when the pumps are powered by “green” electricity, e.g. generated by wind turbines or solar panels. How to extract heat from mine water to heat houses. Small minewater heating schemes have already been successfully developed at different locations in the UK, e.g. at the Markham Colliery, Derbyshire, for heating the offices of Alkane Energy and at Dawdon, County Durham, where heat from mines is extracted for heating buildings at an existing Coal Authority pumping station. The potential for building a heating network for 150 homes using the minewater from the former Caerau colliery, in the Llynfi valley, South Wales, is currently being investigated by Bridgend County Borough Council and the BGS. Similar investigations are underway in NE England, involving Durham University and local councils, looking at the potential of abandoned mines in for heating homes near Bishop Auckland and Spennymoor, County Durham. BGS is also in the process of delivering the research infrastructure for the UK Geoenergy Observatory in Glasgow – a research facility equipped with the newest scientific technologies for investigating the potential of mines for heating homes and buildings. Glasgow was once home to some of Scotland’s biggest coalmines, which, post closure, have flooded with water of around 12°C in temperature. Scientists from across the UK will have access to the observatory and their research and experiments will yield a better understanding of how to harvest the heat in abandoned mines in the UK and elsewhere. Considering that many UK towns and cities grew up around areas where coal was mined, there are many parts of the country that could benefit from this research and from further developing and applying this technology in the UK. October 13th is the UN International Day for Disaster Reduction, with the specific theme of reducing the economic losses resulting from disasters. 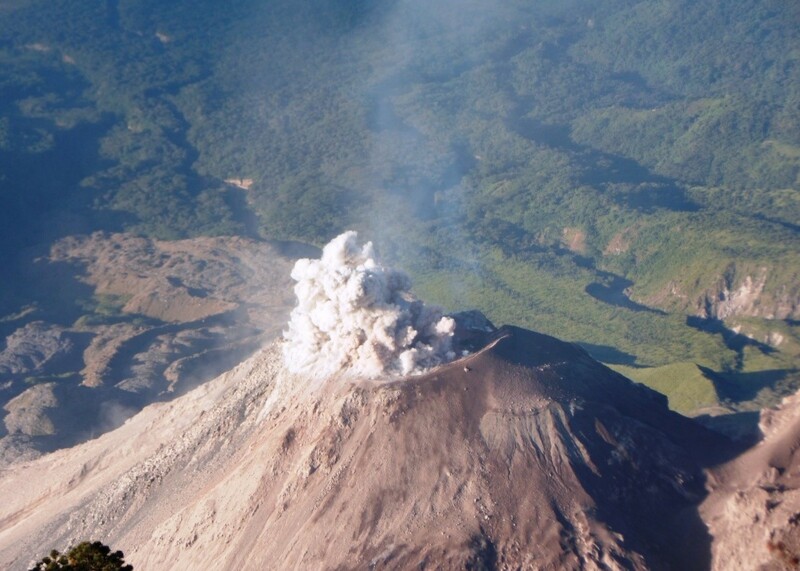 It is a day to remember those communities impacted by disasters, including the recent June 2018 eruption of Fuego volcano in Guatemala and the tragic earthquake and tsunami occurring in Indonesia just weeks ago. It is a day to celebrate the actions that people and communities around the world are taking to reduce their exposure and vulnerability to disasters, and the progress we have made to reduce fatalities from disasters in some countries recent decades. It is also a day to reflect on the research, innovation, training and technology transfer needed to advance this work and ensure sustainable and resilient communities. Natural hazards (e.g., landslides, earthquakes, volcanic events) have a significant impact on lives, livelihoods and economic growth, disproportionately affecting the most vulnerable in society and threatening social and economic development progress. A report published this week by CRED/UNISDR estimate that disasters between 1998 and 2017 resulted in direct economic losses of US$2,908 billion, 1.3 million fatalities, and 4.4 billion people injured, rendered homeless, displaced or needing emergency assistance. Disasters place an additional demand on already stretched budgets, diverting resources away from improving education and healthcare, or developing infrastructure and jobs. The UN Office for Disaster Risk Reduction (UNISDR) estimate that disasters drive 26 million people into poverty every year. It is therefore imperative, if we are to achieve the UN Sustainable Development Goals (SDGs), that we accelerate efforts to reduce disaster risk. The Sendai Framework for Disaster Risk Reduction (UNISDR, 2015) has put disaster risk reduction (DRR) at the centre of the UN development agenda, with an important role for geoscientists. Disasters, however, are a complex challenge requiring many disciplines to work in close partnership if we are to ensure sustainable and resilient communities. Disasters are not an inevitable consequence of geological or meteorological hazards. It is the spatial and temporal coincidence of hazardous phenomena with exposure (i.e., things we value being located in hazard-prone areas) and vulnerability (i.e., conditions that increase the susceptibility of people/infrastructure/systems to the impacts of hazards) that results in the generation of risk and the potential for devastating effects. In this context development challenges of poverty, inequality, lack of access to and overconsumption of resources, climate change, and uncontrolled urbanisation can all change exposure and/or vulnerability, thus contributing to disaster risk. So called ‘natural disasters’ really are not natural at all, and that means we can do something to address them and stem the economic losses that so badly impact communities. BGS has a global portfolio of projects aiming to better understand natural hazards, and reduce disaster impacts. For example, through our Official Development Assistance programme, Geoscience for Sustainable Futures, we are coordinating work on ‘global geological risk’ aiming to improve the lives of some of the world’s most vulnerable communities. Through this work, we cooperate closely with a range of partners (e.g., governments, academics) and disciplines (e.g., geoscientists, social scientists, engineers) in the UK and overseas. A key theme within our hazards work is ‘multi-hazard resilience’, recognising that many communities are affected by multiple hazards that do not always occur independently. Hazards may occur simultaneously, or in quick succession with one hazard triggering multiple secondary hazards. Building on the success of the myVolcano Mobile Application, we are collaborating with partners including the University of the West Indies Seismic Research Centre and the National Emergency Management Organisation of St Vincent to develop a multi-hazard app. This will capture and disseminate data and information about multi-hazards and impacts (e.g. road closures, shelter locations), and enable local management of observations in real time. Our multi-hazards engagement also extends to Guatemala, ranked 4th globally in the 2017 World Risk Index in terms of the risk of becoming a disaster victim due to an extreme natural event. We are working with hazard and disaster risk reduction professionals to characterise the relationships between the many natural hazards affecting the region, aiming to develop new and more holistic approaches to hazard management and disaster risk reduction. Our expertise in multiple hazards is also being applied within a complementary project, funded by the UK Space Agency. METEOR (Modelling Exposure Through Earth Observation Routines) uses Earth Observation approaches (e.g., satellites) to understand exposure to multiple hazards in Nepal and Tanzania, with the approach being extended to all 47 least-developed countries on the DAC list of ODA recipients. Poor understanding of the population exposed to natural hazards causes major challenges to disaster risk management. METEOR will help to address this, providing open and free, consistent data to NGOs, governments, town planners and insurance providers to promote welfare and economic development in these countries and better enable them to prepare for, and respond to hazards when they occur. Through our sustainable development work, we continue to have a leading role responding to requests for humanitarian assistance in the aftermath of disasters, such as the 2015 earthquake in Nepal or the 2017 landslide in Sierra Leone. Our volcanology team regularly provide advice during volcanic crises, often associated with multiple hazard types. We work closely with organisations such as the United Nations Institute for Training and Research (UNITAR), the Food and Agricultural Organization, NASA and MapAction to provide support and geohazard advice during emergency situations, including response to landslides, volcanic eruptions, hurricanes and earthquakes. Through these projects, and many others (have a look through the web links below! ), BGS are taking seriously the call of the UN Secretary General to help tackle disaster risk, contributing to global efforts to ensure a resilient and sustainable future for communities around the world. 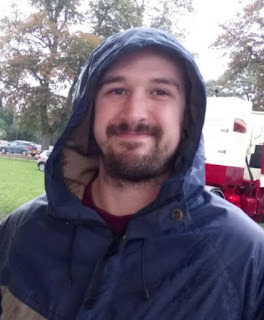 Joel Gill is an International Development Geoscientist at the British Geological Survey, and an interdisciplinary researcher, integrating natural and social science methods to address issues relating to sustainable development and disaster risk reduction. Dan Martin-Mallin and I preparing the samples with some curious onlookers! 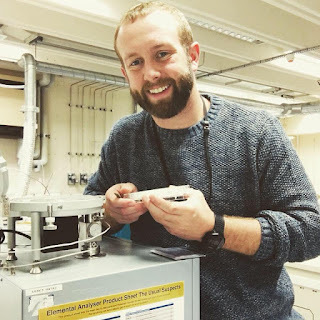 When I sent off my application for an ENVISION research placement at BGS, I didn’t think I would be using liquid nitrogen, running a mass spectrometer, going out in the field to collect my own samples and I certainly didn’t think I would get accepted, but fortunately here I am, writing my first blog about my time at BGS and what an amazing experience it has been! My name is Pyar Pandit, and I’m a 1st year undergraduate chemistry student from the University of Nottingham. 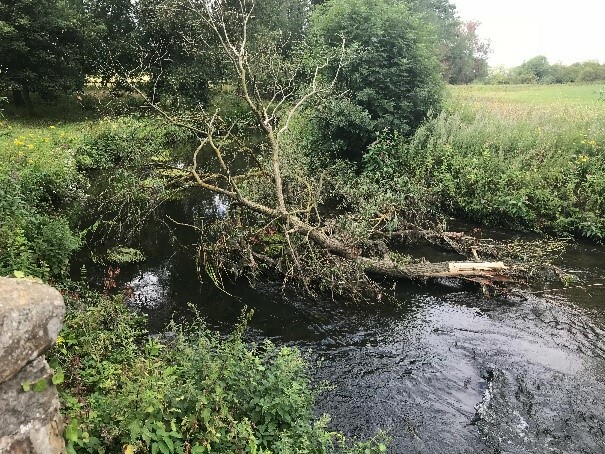 I have been working at BGS for about 8 weeks now on the Skerne project, under the supervision of Dr Barbara Palumbo-Roe and Dr Angela Lamb, aiming to determine the origins of high sulphate in stream waters in north-east England. If you were to ask me to sum up everything I did within those 8 weeks in just a few sentences I simply couldn’t since every week I ended up working on a different aspect of the project in a different location. I wasn’t quite sure what to expect when I first started working here and I’d be lying if I said that I wasn’t a bit nervous, but I quickly settled down thanks to the help of my supervisors and colleagues and was ready to tackle any challenge that came my way. The first week largely comprised of desk work in the James Hutton building, which involved managing past records of borehole data from the target region and reading through several articles for me to get me to grips with the basics of geology, the latter being very interesting since I had no prior knowledge regarding this subject. I was also taught how to use a HACH colorimeter to test for sulphate concentration and how to take field readings and calibrate all the field probes. Soon after, I was sent on my first field expedition to a town in County Durham called Darlington to collect water, rock and soil samples for analysis back in the Stable Isotope Facility. As we arrived at the first site, a large quarry, we soon realised that a huge storm had hit the area and had flooded large parts of the River Skerne. Later that day we also travelled to the main site on which we would be working on (a small farm which the river passed through) to assess the situation, and to our surprise, a few piezometers with data loggers that had previously been installed had been damaged due to the intense flooding. Although this was a setback to the project, we were able to recover most of the data loggers and made quick work of meeting our primary objectives for that expedition. I was able to observe how a typical groundwater field expedition was carried out and taught how to auger (ranging from a depth of 0 - 1.75 metres) and sample the material we collected. Furthermore, I was also given more insight into the geology of the area and what it could tell us about the different processes occurring such as surface water and groundwater interaction in the river or predict where areas of acid mine drainage could be happening, leading to an influx of sulphate. The next day we travelled to 3 different sites and collected surface water samples whilst taking measurements of the field parameters, followed by a collection of 28 groundwater samples from various borehole sites across Darlington in collaboration with the Environment Agency. A couple of weeks later, I was part of another expedition at the same location in which we collected groundwater and porewater samples at different depths alongside constant monitoring of the field parameters. 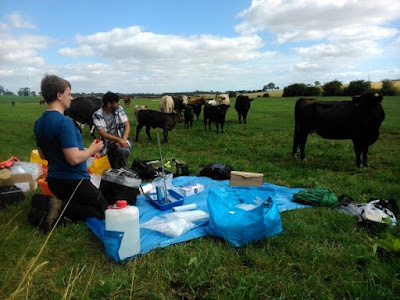 Aside from some curious cows, field probes that refused to stabilise, and a terrible case of hay fever, fieldwork was definitely one of the more exciting parts of the placement and it was quite satisfying to be able to help collect the samples that I would be analysing back in the lab. Even though it could get quite challenging at times, the trip to the pub for food every night definitely made up for it. With the samples safely collected and stored, I was sent to the Stable Isotope Facility to process and analyse them for their sulphur isotope composition (a method that can help to determine the origin of the sulphate). I was looking forward to this part of my placement the most as it would involve improving my skills as a chemist. As soon as I put on a lab coat and a pair of nitrile gloves I felt right at home and soon began processing the samples. I was taught several experimental techniques by Dr Angela Lamb and Dr Andrew Smith to help support me to prepare the water samples for mass spectrometry. Before using the mass spectrometers, I was taught how to weigh out my samples (between 0.6-0.7 milligrams), a tedious process which could either be quite relaxing or incredibly frustrating depending on how the day was going. I then loaded my samples onto the mass spectrometer and learned how to analyse the data it produced. This gave me an insight into normalization procedures and reference material selection, all being extremely fascinating and hopefully giving me a head start with analytical chemistry next year! As part of my time in the labs, I was given a tour of all the stable isotope labs which was very useful as I gained insight into different types of mass spectrometers. 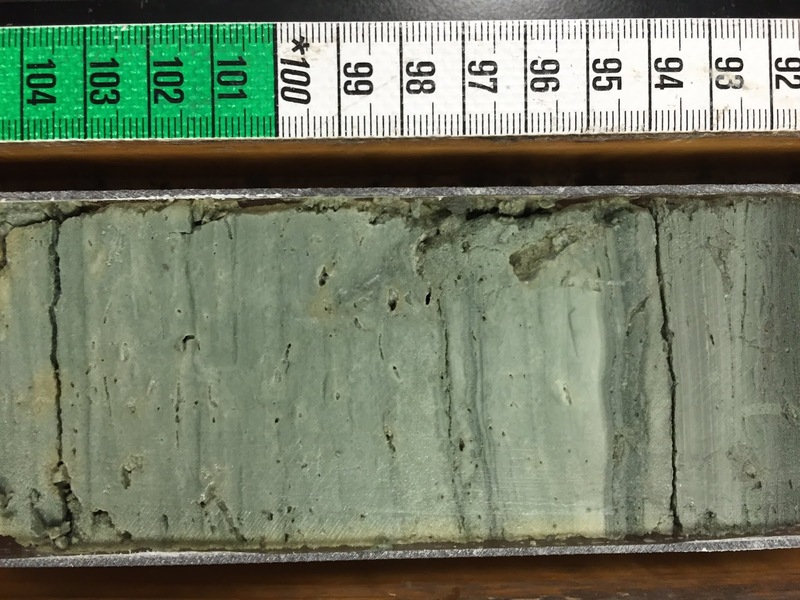 I also had the opportunity to carry out a small project - analysing carbonate samples for carbon and oxygen isotopes from a sediment core taken from a Scottish Loch which had experienced periods of sea water inflow. The aim of the project was to generate an accurate depiction of how the water chemistry in the loch developed overtime. This project further helped to demonstrate the importance of isotope analysis and was a great change of pace to the usual lab work. These past 8 weeks have truly been an amazing experience and I’m incredibly grateful for being offered a research placement here. This placement had a huge impact on my life as living on my own, working with new people, tackling difficult challenges and delving into a new field of research has allowed me to reflect on myself, develop my independence and gain a better understanding of which direction I want to lead my career into. I have also developed a new-found respect for geology, geochemistry and the importance of isotopes and look forward to working with these areas a lot more in the future. I would like to thank everyone who helped me out throughout these 8 weeks and really appreciate the patience they had with me. I’m Josh McIntyre, a digital marketing apprentice at BGS. I’ve been here now for around 3 months, doing all sorts from product promotion at events like FloodExpo to graphics and illustration for various presentations and projects. During my first week at BGS I must have met around 100,000 people (at least it felt like that many) while being whizzed around from department to department, all of whom were incredibly friendly. I quickly learned what a wide range of products BGS work on and how much I was going to have to get my head around if I was going to help market all this. The variety of tasks I have been set has allowed me apply my interests into my work, making my time here so far very enjoyable. My most recent project has been attending FloodExpo and using that experience to create a guide for people attending future events. I had a great time at the event, getting to walk around and see what the flood community has to offer as well as sitting down with people to explain what our SuDS data product is and how it can be used in their industry. This was my first taste of presenting to people outside of BGS and it was no way near as scary as I expected! Recently I went through my first week of online seminars for my apprenticeship ran by inTraining which covered the fundamentals of digital marketing. Being an apprentice is a strange mix of doing and learning, having been out of education for over a year it was quite strange to go back to a classroom format, even if it was just a virtual one. Over the next year of working here I will have to complete modules on 7 main topics including web development and data analytics. I’m excited to see how well the knowledge from my apprenticeship and my experience working here will merge together to give me a proper understanding of my field of work. Why did some Homo sapiens, after evolving in eastern Africa and living there for tens of thousands of years, decide it was time to up sticks and move to Asia? Why did cities and vast empires in the Middle East collapse suddenly around 4,000 years ago, and again 3,000 years ago? People have often proposed a link between climate change and the course of human history, but to test these theories we need to know exactly how the climate changed back through time. That’s where people like me come in. My job is to work out how climate changed in the past. Because there are no meteorological records going back more than a few hundred years, we have to come up with clever ways to reconstruct past climate. I use lakes as a historical rain gauge. In some lakes, carbonate – which is like the limescale in your kettle at home – forms every year in the surface waters. In this carbonate, there are different types of oxygen, and the ratio of one type of oxygen to another varies depending on factors such as how deep or shallow the lake was at the time it formed. This carbonate then falls through the water to the lake bed and is locked away as an archive of lake level change…until scientists come along. We drill into the sediments to take cores. We then analyse the ratio of one type of oxygen to another at different points back through time from the carbonates in these sediments, and from that can reconstruct changes in lake level, and hence climate changes between wet and dry, back through time. Let’s consider two examples of how climate change might have changed the course of human history. Firstly, why did our species, Homo sapiens, leave Africa after evolving there? Scientists have found evidence of Homo sapiens in the Middle East as far back as 130,000 years ago. However, other researchers have analysed the DNA of modern humans and concluded that modern non-Africans are likely to be descended from people who left Africa via Egypt around 60,000 years ago, suggesting the people who left 130,000 years ago died out before they could successfully populate the rest of the world. But why did Homo sapiens leave Africa? Maybe climate change played a role. We have used sediments taken from an old lake on the border between Ethiopia and Kenya. We showed in a paper that has just been published that there was a climate shift in eastern Africa at the time the successful dispersals out of Africa occurred around 60,000 years ago – the climate was changing from being very variable with multiple fluctuations between wetter and drier conditions, to a more stable climate where there was less change. During the more variable times, it was difficult for Homo sapiens, and only those who adapted to each climate change survived. This led to natural selection for the most flexible, highly skilled individuals and populations. When the climate then became more stable, it was easier for Homo sapiens to survive so populations increased. This led to pressure, as more and more humans tried to survive on the food and water resources of eastern Africa. This may have therefore pushed some people out of the region in order to try to find new lands to live on, and because of the natural selection during the times of variable climate they had the skills required to migrate out of Africa. Our second example brings us much closer to the present day. Between the time of the migration out of Africa and 5,000 years ago, humans had started playing musical instruments, developed farming and invented the wheel. But at approximately 4,000 years ago and again at 3,000 years ago it seems big civilisations ‘collapsed’ – the archaeological evidence suggests they either went into decline or ceased to exist all together. Again, climate change has been used to help account for these sudden events. A drought lasting several hundred years has been identified ~4,000 years ago in climate records from lakes in the Middle East – for example in our record from a Turkish lake that was published in a paper in 2015. In Egypt, the Nile floods failed, leading to famine and political upheaval, and they even stopped building pyramids for a few hundred years. Around 3,000 years ago we identify another drought, at the time the Hittites, who lived in central Turkey, went into decline. Nowadays in central Turkey, there is only roughly 300 mm of precipitation a year and even with modern technology agriculture is difficult. But at the times of these ‘collapses’ we have shown it would have been even drier. These droughts may have weakened civilisations and combined with civil conflict, invasions and population pressures to cause the ‘collapses’. We will never know for sure what killed off these civilisations, but what we can say is that it would have become much more difficult to grow crops, and hence for people to feed themselves, during these droughts. Therefore, climate seems to have been a major force in shaping the course of human history – from explaining the migration of early Homo sapiens out of Africa, to contributing to the collapse of civilisations. There are important lessons for the future here. The Middle East is likely to bear the brunt of climate change this century, with drier conditions due to falling precipitation and increased summer evaporation. Eastern African is predicted to see some large climate changes too. Already politically volatile regions, fighting over water resources is likely to intensify conflicts this century. In the Middle East, it may become as dry as it was at the times of the droughts 4,000 and 3,000 years ago, and the question is whether modern technology and politics will prevent the ‘collapses’ of civilisations that we saw in the past. This is really starting to get on my nerves now. For the umpteenth time, I have heard reference made to the world's definition of boring: geology. What?! So why doesn't the rest of the world see this? Is it because us geologists are really boring, or is it actually that we need to be better at talking about what we do? 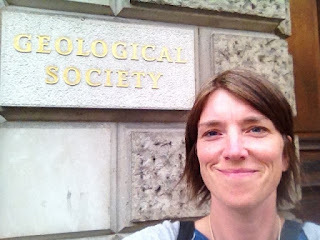 I went to London to a conference run by the Petroleum Group at the Geological Society where Communicating Geoscience was the topic. Have a listen to the podcast to hear all about it. Thanks also, of course, again to the Petroleum Group of the Geological Society, particularly Dr Kirstie Wright, Heriot-Watt University.